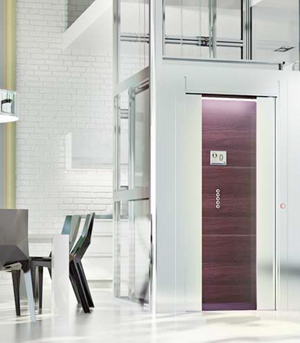 Home Elevators, the new generation of lifts specifically designed for private areas. A Home Elevator makes you feel “at home”: every ride is a relaxing and convenient journey due to the new soft drive technology. The new Home Elevators 7Series stands for individuality and a modern lifestyle. They are a piece of art in personalized tailor-made design: The puristic style Cool combines elements of stainless steel, glass and wood. Noble, the classic form with dark oak and walnut woods, stands for elegance and tradition. The Natural style’s cabin wall is made of a black painted structure and wooden battens. In the Romantic style cabin floral patterns are combined with varnished wood with raised moulding. The cabin design Opulent pays homage to individuality with its extravagant and exclusive materials like cushioned leather.